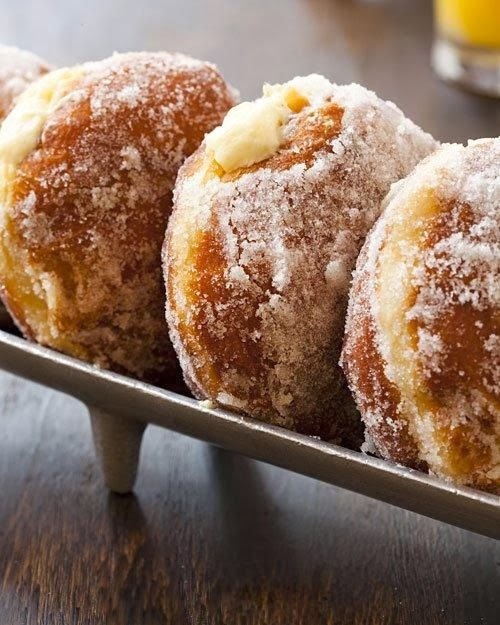 These decadent doughnuts from chef Joanne Chang's "Flour" cookbook quickly sell out every time she makes them at her Boston-based Flour Bakery + Cafe. In the bowl of an electric mixer fitted with the dough hook attachment, stir together yeast and milk; let stand until yeast is dissolved, about 1 minute. Add flour, 1/3 cup sugar, salt, and eggs; mix on low speed until dough comes together, about 1 minute. Continue mixing on low 2 to 3 minutes more. Add butter, a few pieces at a time, mixing after each addition and until butter is fully incorporated and dough is soft, 5 to 6 minutes. Remove dough from bowl and wrap tightly with plastic wrap. Refrigerate at least 6 hours and up to 15 hours. Lightly flour a baking sheet; set aside. On a well-floured work surface, roll out dough into 12-inch square about 1/2 inch thick. Using a 3 1/2-to-4-inch round biscuit cutter, cut out 9 doughnuts. Transfer to prepared baking sheet and cover with plastic wrap; let stand in a warm spot until they've doubled in height and feel poufy and pillowy, 2 to 3 hours. Fill a large heavy-bottomed saucepan with oil to a depth of 3 inches; heat over medium-high heat until it reaches 350 degrees on a deep-fry thermometer. Working in batches, place doughnuts in the hot oil, taking care not to crowd them. Fry until golden brown on one side, 2 to 3 minutes; turn and continue frying on remaining side until golden, 2 to 3 minutes more. Using a slotted spoon, transfer doughnuts to a paper towel-lined baking sheet until cool enough to handle. Place remaining cup of sugar in a small bowl. Toss doughnuts in sugar, one at a time, to evenly coat. Return doughnuts to paper towel-lined baking sheet to cool completely, 30 to 40 minutes. Meanwhile, in the bowl of an electric mixer fitted with the whisk attachment, beat heavy cream until stiff peaks form. Gently fold in pastry cream; you should have 3 cups of filling. Transfer to a pastry bag fitted with a small round tip; set aside. Poke a hole in the side of each cooled doughnut and fill with about 1/3 cup filling; serve immediately.